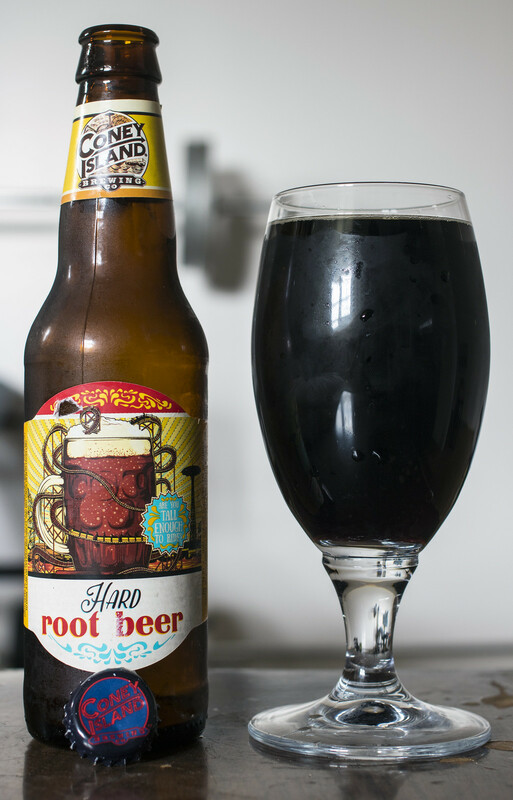 The newest alcoholic root beer available here in Manitoba is Coney Island Brewing's Hard Root Beer. Coney Island Brewing is now a subsidiary of Boston Beer Co, makers of Sam Adams but more widely known here in Manitoba as the owners of Twisted Tea. So, for Coney Island to make its way into Canada, it will compliment Twisted Tea quite well, especially with boozey root beers selling off the shelves right now. Sure, Not Your Father's Root Beer isn't available in Canada, but that's not stopping people from buying up as many malt root beers as they can! Appearance: Very dark brown, almost black, starts off with a lot of fizzy carbonation just like your typical non-alcoholic root beer but the head diminishes into nothing except a few minuscule bubbles around the side. Aroma: Black liquorice is the first and most dominant aroma of this hard root beer.. not bad, smells just like a typical root beer so far. Other aromas I'm noticing vanilla extract, a light caramel malt, light woodiness (birch), brown sugar and a light booziness to it. Taste: Quite a bit your typical non-alcoholic root beer oddly enough.. reminiscent of childhood. The root beer is fairly smooth yet has a bit of that carbonated/black liquorice bite in middle of the tongue that you get in a regular root beer. Notes of vanilla, caramel, black liquorice, brown sugar, various herb notes, and a light birch woodiness. Lightly boozey on the palate but if I wasn't told that this was a malt-based root beer, I would have never known. Overall Thoughts: Easily one of the better boozey root beers on the market right now. It's smooth and creamy yet has a bit of a fizzy bite on the palate like how you would remember from your childhood. Quite sweet so I couldn't drink more than one in one sitting. Surprisingly 5.8% ABV.. sure there's a bit of notes of booziness here and there, but still surprised it's that high ABV.